As a reminder, you'll need to click the pix to get better views. As I mentioned in an earlier post, Inso is planning on improving his photography by means of a light tent and the correct amount of lighting. Even though this is a plan for the coming weeks, it will not prevent him sending me pix...even if they aren't as good as they could be. All the pix are now back! Some may appear blurry but that is down to re-sizing them. If you click on any of the pix you will get better ones, with a sharper image and usually a bit bigger size. Inso hasn't done any hobby work for the last day or so and today he went and did something completely different. He went to a his friend's, child's birthday party and spent 3 hours painting faces! By the end of the party there were quite a few tigers, a couple of skull faces, a werewolf and enough little butterflies to fill up a collector's display case. Inso said it was good fun but his legs were killing him by the end as he had to lean forward in his chair all the time and concentrate on what he was doing. I'm not sure what is on the hobby-cards for the foreseeable future but if I know Inso, I'm sure the pix will be turning up thick and fast, any time soon. I'm sure that everyone who has visited Inso's World over the last day or so have noticed all the signs about moved photos. Well, I am currently sorting through all the missing pix and uploading them from the PC rather than linking them from the on-line photo album. There are two things to note on this process. 1. It is taking a little time. I have done 3 months so far and have 11 to go! 2. The pics that are on view are not the best quality. That means that in order to see the pix in their proper glory, you'll need to click on them. I can see what Inso is trying to do and it would appear that the buzz word is CONSOLIDATION. He wants to set his court in order before he continues much further, that way things will be easy to navigate through, on his on-line album. Inso has been telling me about doing this update for a while now and I guess he just decided that now was the time. 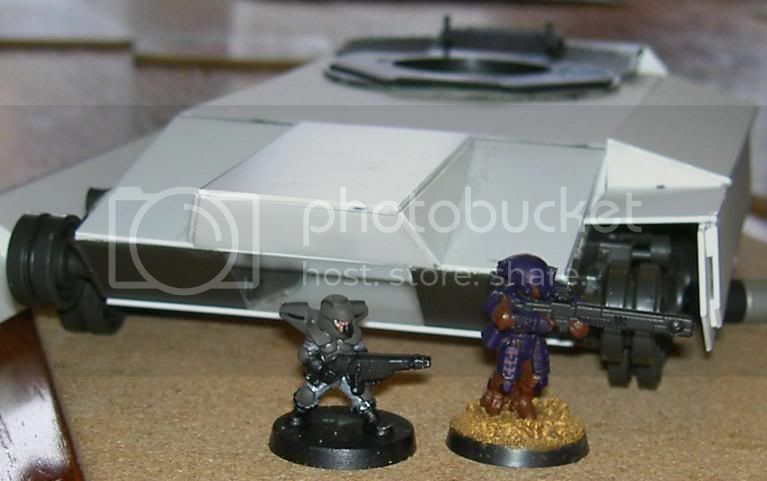 With pictures in mind, Inso is also in the process of sorting out a light tent for his miniature photography. He has said that he is likely to buy one rather than build one so that it folds flat and does the job without too much extra effort. Hopefully his picture quality will improve and be more 'standardised' than it has been...we'll see. Well...remember to click on the pix to get a better view and I'll catch you later! Inso has just let me know that the pix on the blog will be disappearing for a short while due to him sorting out his on-line photo album. The plan is to re-arrange everything into their own separate albums, rename some pix and take a few new ones. This will take time but rest assured, things will be back to normal very soon. I'm sure that the picture could have been better but Inso has recently changed his painting lamp and is still getting used to how it affects his photography. 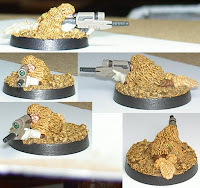 The tank is still plodding along and there is a little more paint on the leader of the Space Rangers but I think that Inso will be finishing his sniper squad before much more progress elsewhere. 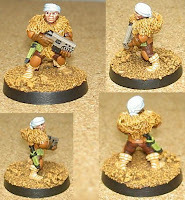 Now there are only two more left to finish the squad. I doubt if much will get done tomorrow as Inso is going away for a few days to visit family. ...but you never can tell. The picture isn't the best but I suppose he was tired. 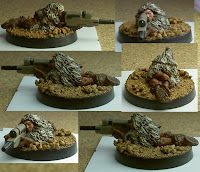 It is the second spotter from his Desert Veteran sniper squad. It was one of those spur of the moment things. 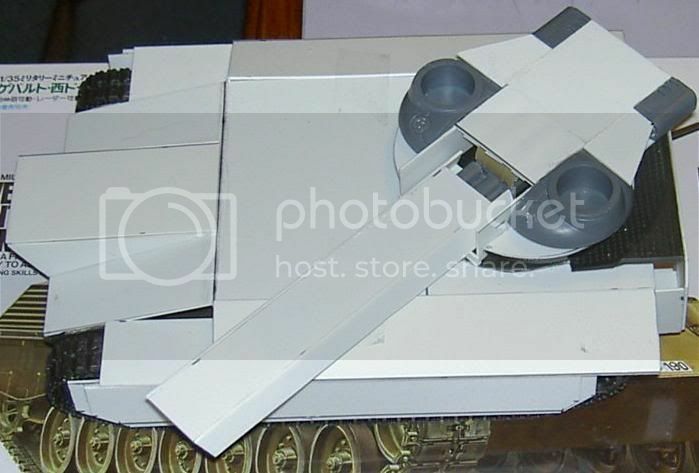 I know that he has been working on his tank today but he said that it wasn't in a condition for pix due to it being slightly dis-assembled (the side-skirts, tracks and a few wheels have been removed to gain access to areas that needed gaps filling). 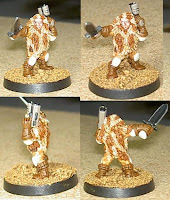 They are plastic, single pose miniatures that come 5 to a pack at £2-50 a pack...so not bad at all for 50p a piece. I think he has started to paint these blue to escape from all the camouflage he has been painting lately. As far as Inso is concerned, he is going through the gap filling phase at the moment and fleshing out various areas. 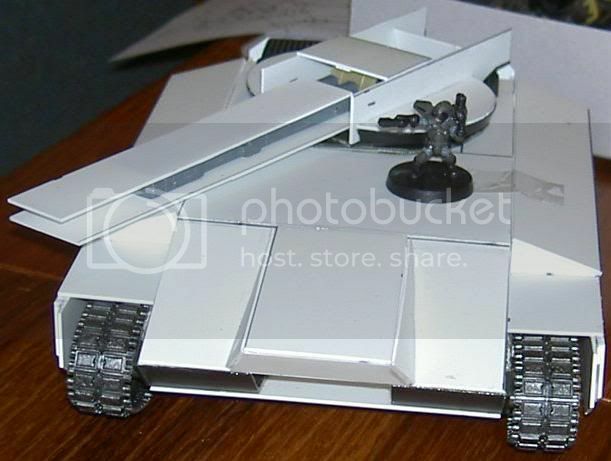 During this process, he has built up the turret a little, added a little detail to the main gun, added a bit more thickness to the side skirts (so the tracks look more at home) and added further shape to the rear of the tank and the track guards. 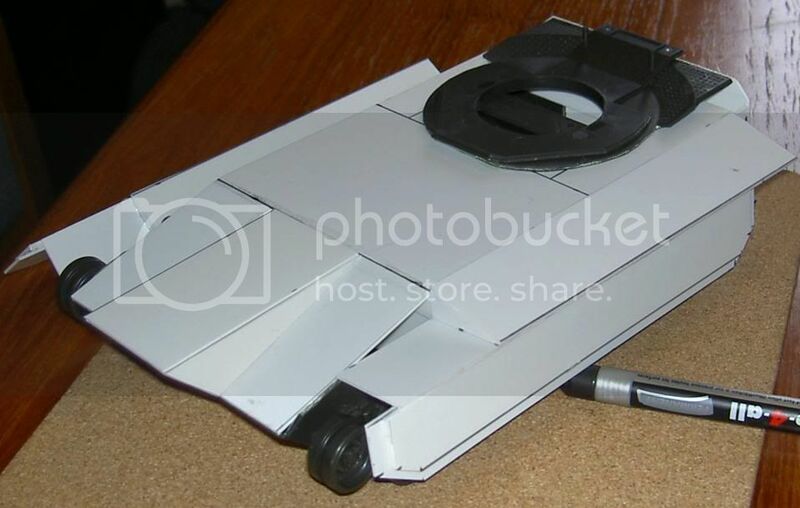 One thing Inso has mentioned is that there is a further layer of plastic to go over the entire tank, so the roughness of the edges will not stay. There is still a lot of work to do but Inso has a few days off work and with all the snow, it looks like he may stay in for long enough to progress things. The basis for the outer gun cover is in place and the grey bits on the side are where the close defense turrets will be going. The curve from the rear grey bits on the turret will blend in with the side grey bits (in time) and the turret base will slope up towards the side turret mounts. The middle of the turret will be higher than it is at the moment but not very much. The lump on the front is where the troops disembark and either side will be a small turret for close support. Just above each turret, on the slope, will be a driver's position (one either side). 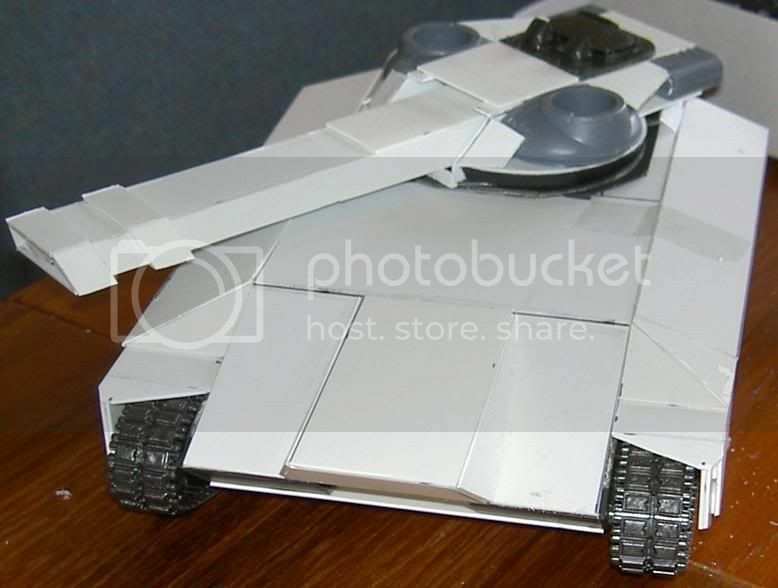 The main turret will be quite broad but very flat. There will be three main guns and a pair of 'all round defense' guns on the sides. According to Inso, the whole thing will have an electric power plant (using advanced crystal energy) to not only drive the vehicle but power the weapons as well. The three main guns will charge up, fire and then have to recharge. The idea is that while one is firing, the other two are recharging so there will always be a gun ready to fire. In an emergency (or as part of a main battery) all three guns can fire at once causing an awesome amount of damage but will then have to spend time charging, leaving the tank vulnerable. Having everything electric negates the need to carry ammunition. 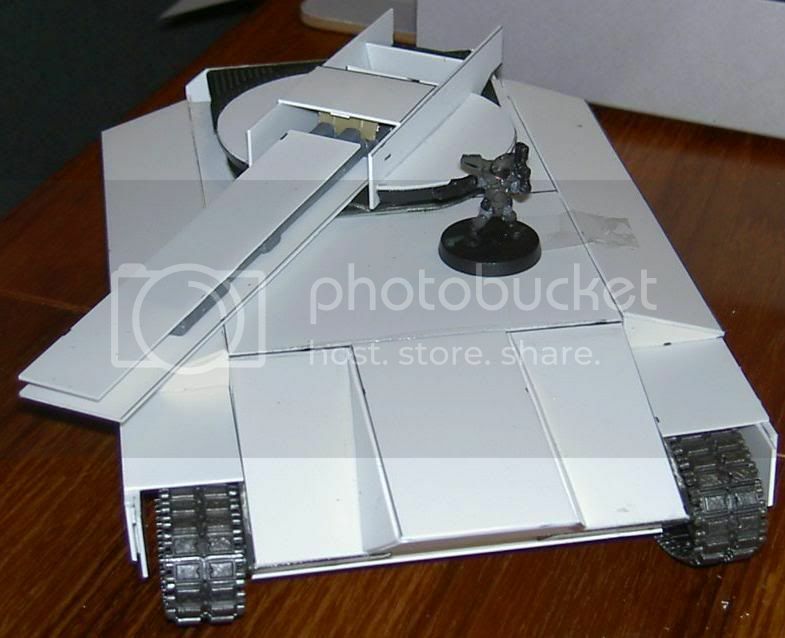 If you look at the top picture, there is a line going across the tank, just in front of the turret. In front of the line is the transport area, behind is the turret and either side, the powerplant/engines. Well...yet another change of direction! Let's hope that this one gets further than the last dozen or so tank builds...they usually don't get finished and get abandoned to the parts bin or the dustbin!